A new business is like a newborn baby. It requires a lot of attention and investment of both your time and money in order to grow into a successful enterprise. In order to start off on the right foot, every business owner needs to obtain the business licenses required under law. 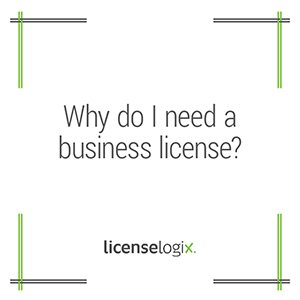 Having a business license helps identify your business to potential customers as a legitimate business. With a business license you can confidently advertise yourself as a “licensed” business. Not only will this increase you confidence as a business owner, but it may potentially bring in business as your customers will feel secure in knowing you are appropriately licensed. With a business license you can become a member of the Better Business Bureau and other occupational groups that will make customers feel more comfortable about working with you. Proof of a business license will also be needed to grow and expand your business. For example, in most cases, you will need a business license to open a business bank account, rent business space, or open a wholesale buying account. Further, according to research by Professors Kleiner and Krueger, licensed business owners can make up to 15% more than unlicensed individuals with similar skills. Having a business license gives you a competitive edge and the advantage of greater earning potential. Not maintaining the appropriate licenses, permits and tax registrations before doing business can expose you to expensive penalties and put your entire business in jeopardy. The ramifications of a blunder can seriously impede operations, destroy good will and unnecessarily cost companies thousands of dollars. Regulators do not discriminate—an enforcement action may be imposed whether the company is a mom-and-pop corner store or an established corporation. Aside from monetary penalties, cessation of operations, and potential criminal sanctions, citations also impair the morale of businesses. These penalties can apply to both willful and ignorant violations. Having the appropriate licenses is a mandatory aspect of operating almost any business. However, with thousands of different licensing jurisdictions across the U.S., it can be extremely challenging for a new business to understand all of the requirements and time-consuming to manage ongoing compliance. The licensing process can involve completing confusing applications, gathering supporting documentation from many different departments, and interacting with state and local bureaucracy. The experts at LicenseLogix can take over all license research, assembly, and filing. Our goal is to prepare everything related to the license application except the client’s signature so you can concentrate on more important day-today duties of your business.